William Maddern Eddy was the son of John and Constance Eddy of Carnyorth, born in 1897. John married Constance, daughter of James and Elizabeth Maddern of Carnyorth Stennack, in 1891. In 1899 Constance died leaving John with four young children, John aged six, Elizabeth aged four, William aged two and Constance, who had just been born. Constance's sister Mary, a widow, came to live with the family in Higher Botallack. When war broke out William and his father were both miners. William enlisted in June 1916 at Penzance, he was 18 years old and gave his father as his next of kin. He was in the reserve from 16 October 1916 to 8 January 1917 when he was assigned to the B.E.F. and sent to the Western Front. His brief military papers show that he served in the 12th Durham Light Infantry as Private 54172 and that he was killed in France on 7 June 1917 after a mere six months at the front. Under Cause of Death William's papers say ' Regarded as dead', in other words he was missing, presumed dead. His body was never found and his name was inscribed on the Menin Gate Memorial. The Menin Gate bears the names of 54,000 officers and men who have no known grave and is one of four memorials to the missing of the Ypres Salient. No details of William's death or the action in which he fell are included with his papers but the 12th D.L.I were involved in the attack on Hill 60, part of the battle of Messines, on 7 June 1917. Following the detonation of 19 mines and an artillery bombardment the 12th advanced over the ridge in a coordinated attack with other units. Presumably Private Eddy was killed in this action. In March 1919 William's father, John, prompted by an announcement that almost all prisoners of war had now been accounted for, wrote to the authorities to ask if there was any news of his son about whom he had no news other than “a letter saying he must be dead”. No reply is included with the papers but the inscription on the Menin Gate index testifies to the fact that William is dead, aged 19 years. 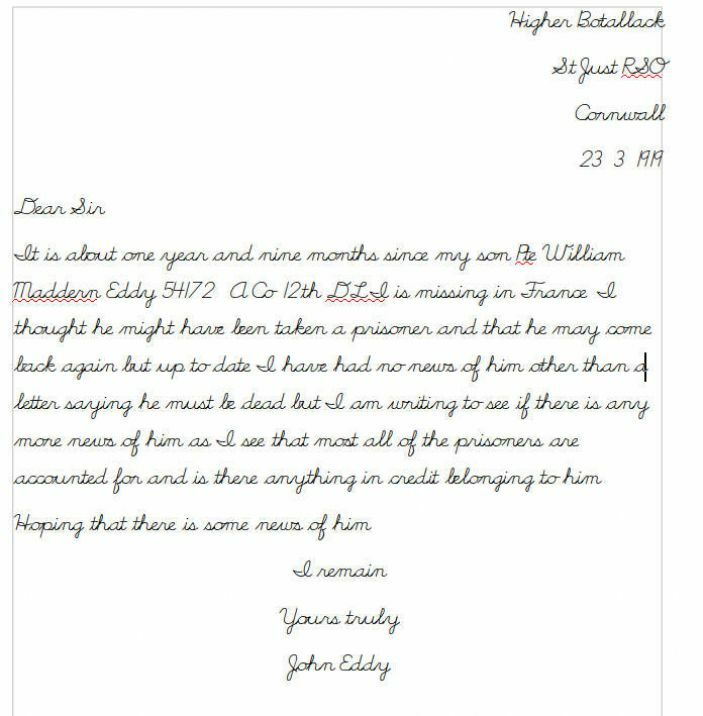 Here is the text of the letter written by William's father.